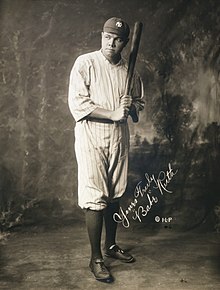 George Herman "Babe" Ruth, Jr. (n. 6 februarie 1895 – d. 16 august 1948) a fost un jucător de baseball american, care a jucat 22 de sezoane în Major League Baseball (MLB) între 1914 și 1935. El a fost cel mai bun marcator din istoria baseball-ului până în 1974 când recordul său de 714 puncte a fost depășit. A debutat în 1914 la echipa Boston Red Sox, acolo devenind de la jucător defensiv la marcator. S-a transferat la echipele New York Yankees în 1920 și la Boston Bravers în 1935. Appel, Marty ( 2012 ). Pinstripe Century: The New York Yankees From Before the Babe to After the Boss. New York: Bloombury USA. ISBN 978-1-60819-492-6. Creamer, Robert W. ( 1992 ) . Babe: The Legend Comes to Life (ed. First Fireside). New York: Simon & Schuster. ISBN 0-671-76070-X. Graham, Frank ( 1943 ). The New York Yankees: An Informal History. New York: G.P. Putnam's Sons. OCLC 1825210. James, Bill ( 2003 ) . The New Bill James Historical Baseball Abstract (ed. First Free Press trade paperback). New York: Free Press. ISBN 978-0-7432-2722-3. Montville, Leigh ( 2006 ). The Big Bam: The Life and Times of Babe Ruth. New York: Broadway Books. ISBN 978-0-7679-1971-5. Neyer, Rob ( 2000 ). Rob Neyer's Big Book of Baseball Blunders. New York City: Fireside Books. ISBN 0-7432-8491-7. Pietrusza, David ( 1998 ). Judge and Jury: The Life and Times of Judge Kenesaw Mountain Landis. South Bend, IN: Diamond Communications. ISBN 978-1-888698-09-1. Reisler, Jim ( 2004 ). Babe Ruth: Launching the Legend. New York: McGraw-Hill. ISBN 0-07-143244-2. Sherman, Ed ( 2014 ). Babe Ruth's Called Shot: The Myth and Mystery of Baseball's Greatest Home Run. Guilford, CT: Lyons Press. ISBN 978-0-7627-8539-1. Smelser, Marshall ( 1975 ). The Life That Ruth Built. New York: Quadrangle/New York Times Book Co. ISBN 0-8129-0540-7. Spatz, Lyle; Steinberg, Lyle ( 2010 ). 1921: The Yankees, The Giants, & The Battle For Baseball Supremacy in New York. Lincoln, NE: University of Nebraska Press. ISBN 978-0-8032-3999-9. Stout, Glenn ( 2002 ). Yankee Century: 100 Years of New York Yankees Baseball. New York: Houghton Mifflin Company. ISBN 0-618-08527-0. Wagenheim, Kal ( 1974 ). Babe Ruth: His Life and Legend. New York: Praeger Publishers. ISBN 0-275-19980-0. Ultima editare a paginii a fost efectuată la 16 februarie 2019, ora 13:59.